Thomas Payne RV furniture has become synonymous with quality. 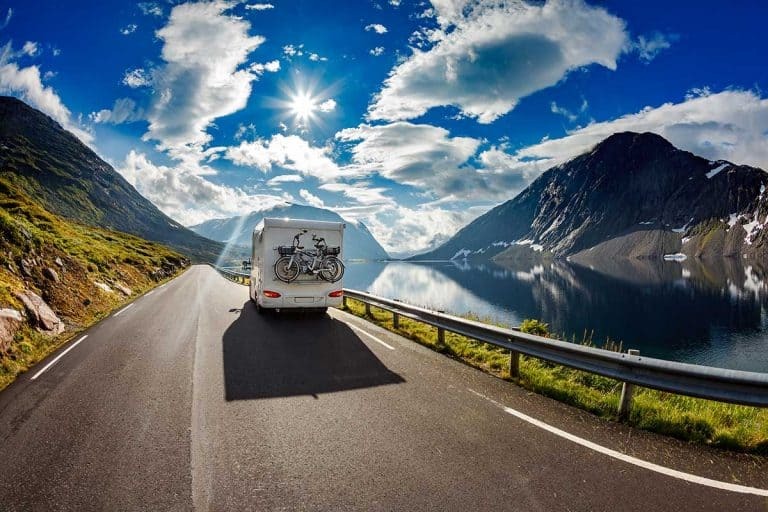 The brand is part of the Lippert Components family of RV parts, specializing in sturdy, solid long-lasting furniture pieces that are made specifically for motorhomes, travel trailers and 5th wheels. When you buy an RV – especially an upscale one – you may find that the couch and armchairs are of the Thomas Payne line. It may even be a selling point in its own right. Fortunately, you can also replace old units with new items by choosing one of their gorgeous pieces. Where can you by Thomas Payne furniture? 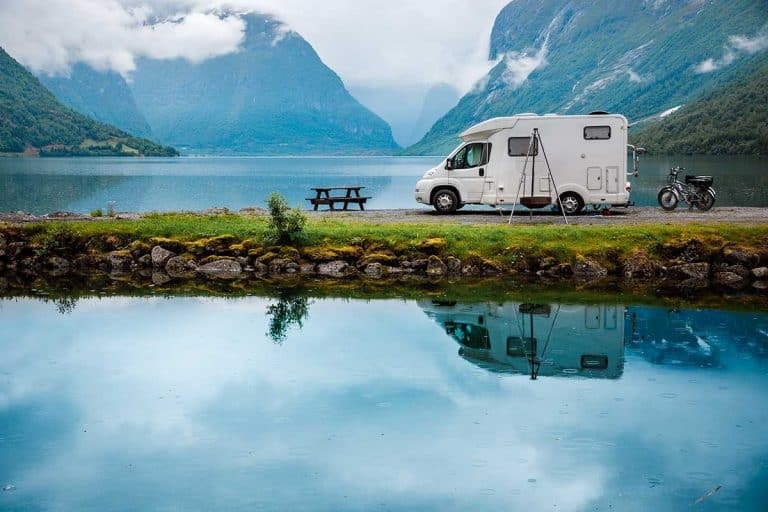 This brand is so popular, you can find it in most online – and brick-and-mortar – RV shops. 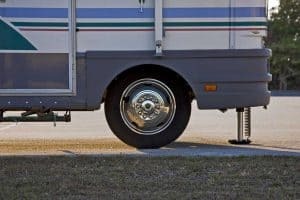 Take a look at our post about the top stores for RV furniture and you’ll find that many of them carry the TP line. In this post, we’ve linked to some examples of great Thomas Payne furniture on Amazon and ETrailer. Yup. There’s nothing stopping you from ordering a couch or armchair online these days! This seat is the perfect pick for a small RV. It has a traditional appearance that features fully-padded armrests to maximize comfort. It was impressive to see how easy the sofa converts into a bed in four simple steps. The high-density foam inside the plush upholstery ties together with a neutral gray-white hue. Furthermore, there are no clunky support bars that annoyingly poke your back as you try to sleep. Click here to buy this sofa. This Euro Chair provides you with padding in all the right places and allows you to rise out of the seat with ease. The recliner seamlessly transitions between sitting and reclining with the ease. Furthermore, the high-density foam is protected by low maintenance, chic looking latte color. The entire weight of the sofa is about 62 pounds, making it easy to handle. Get this amazing chair here. This tri-fold sofa redefines healing and relaxation thanks to its fully padded sleeping surface that instantly takes care of your back. The tri-fold sofa converts into a high density, fully supportive bed in four simple steps. To put it back together, you can follow the same steps but in reverse. This tri-fold sofa is built with low maintenance care in mind, so you can bring your kids and pets along for the ride. Click here to learn more about this eclectic sofa. As a feature-rich, dual reclining sofa with all the bells and whistles money could buy, this product by Jaleo Chocolate will make outdoor adventure journey radically more comfortable. This dual reclining sofa was designed to offer superior ergonomic comfort and a unique style. It is inspired by Nordic design, featuring gentle box border cushions that create a bucket seat to provide maximum comfort. The multi-density foam is designed to provide years of enjoyment. The elastic webbing is engineered for high resiliency while the different contour cuts provide an ideal ergonomic seating experience. The upholstery is made with PolyHyde Euro leather featuring a chocolate color that looks absolutely elegant. Click here to buy this furniture. This recliner chair is perfect for lounging in, providing an eclectic option that can overhaul your RV in an understated style. The chic upholstery is designed with a luxurious polymer coating and leather vinyl fabric that feels super comfortable to the skin. The best part is the low-maintenance requirements of the material. The recliner chair is designed to withstand the rough terrains of outdoor use, including, of course, any rough handling by children and pets. This recliner is also inspired by a minimalistic, Scandinavian design featuring a gently curved roll arm that should provide a perfect place to rest your arms for years. The handy lever on the side of the chair can be activated to help you kick back and relax in a reclined position at an angle. Even the footrest is made with low-maintenance high-density components that look chic and easy to clean. 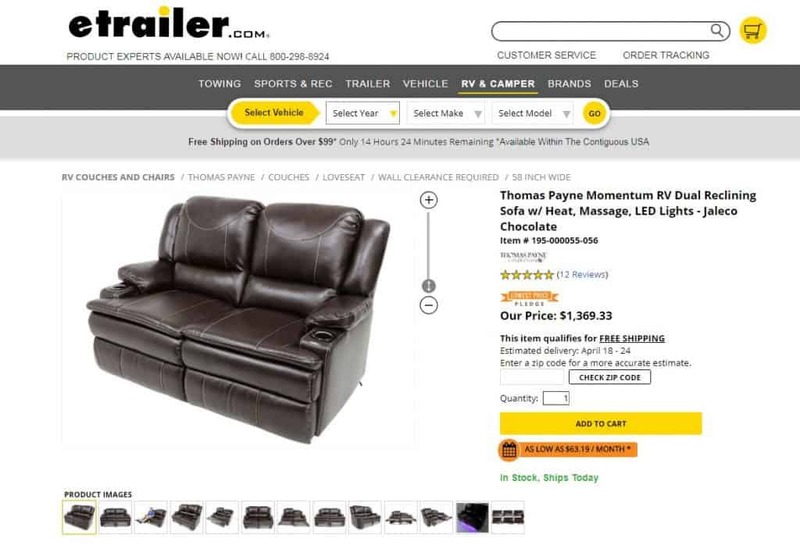 Provide your RV with modern and contemporary charm with this luxurious and elegant Thomas Payne recliner. It promises exceptional comfort with a generous foam density underneath the seat. A footrest at the bottom brings additional comfort. 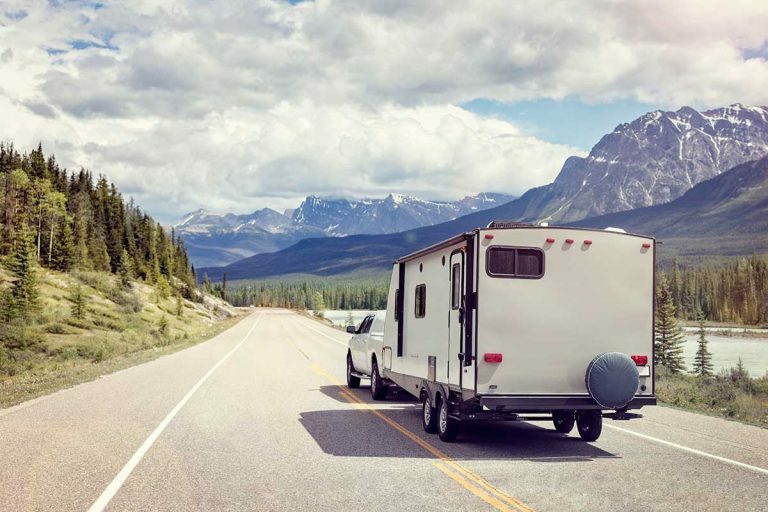 This piece will add value and style to your RV. As is true for most Thomas Payne products, this chair is designed for minimal maintenance. We were impressed with the remote controlled heat function that can provide warmth to your back. The base can be fully rotated 360 degrees, providing the ultimate comfort. Best of all, this chair is extremely affordable, and if you buy it now, you’ll save almost $200. Click here to buy this recliner. This loveseat features stylish, lean lines, with soft Leather and a sturdy hard frame construction that is bound to overhaul your RV’s interior décor. The Majestic Chocolate upholstery completes your RV’s interior design, adding tons of flair. Just make sure that your RV door is wider by 26 inches or more to accommodate this recliner. We really like the fact that you can convert the loveseat to a bed whenever you feel like it, at minimal effort. Simply tug away at the tab on the front of the furniture pull it out to reveal a queen sized bed. Furthermore, if you want to turn the bed back into a couch, follow the steps but in reversed order. The low-maintenance upholstery will ensure that you won’t be needing maintenance services for a long, long time. This low-maintenance vinyl leather loveseat is truly an architectural marvel to look at. It combines a minimalistic design with unsurpassed manufacturing. 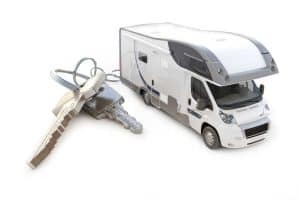 The piece will help you give the desired interior look to your RV, so you can make a statement. It is designed to be stylish, comfortable, and sturdy and built to withstand the test of time. The upholstery has top-grade leather to make maintenance less of a chore. The neutral gray doeskin color is sure to add a ton of flair to your RV. Just like the previous entry on this list, this loveseat can be converted into a bed with ease. Perfect for rocking in the RV, this swivel recliner invites you to relax and sit back in your camper. Founded atop a base that can fully swivel 360 degrees and polished wood construction, this piece is crafted with manufactured foam fill, headrest, padded armrest, and footrest for maximum comfort. The Euro leather upholstery lends a tailored touch which provides a neutral hue that increases versatility in terms of interior design. 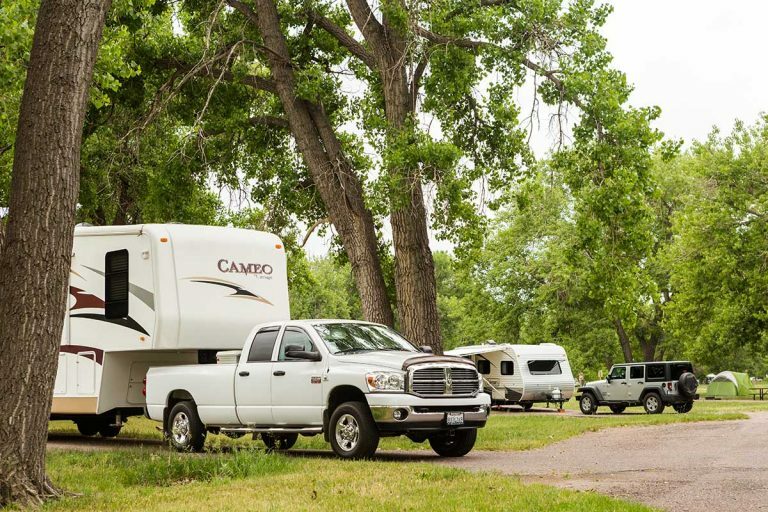 Its ergonomic design, ability to recline, and full swivel make it a must-have for your RV. This recliner is built to offer a superior, enhanced experience to the user. At its center is a fully featured console that can be operated to activate an extremely comfortable massage function and heat to keep your back warm. What makes this recliner stand apart from others are the 2 LED lighted cup holders so you won’t have to go into the kitchen to dispose of your drink. The cup snugly fits inside the cup holder, letting you doze off into a peaceful slumber, facilitated thanks to the high-density internal foam components. 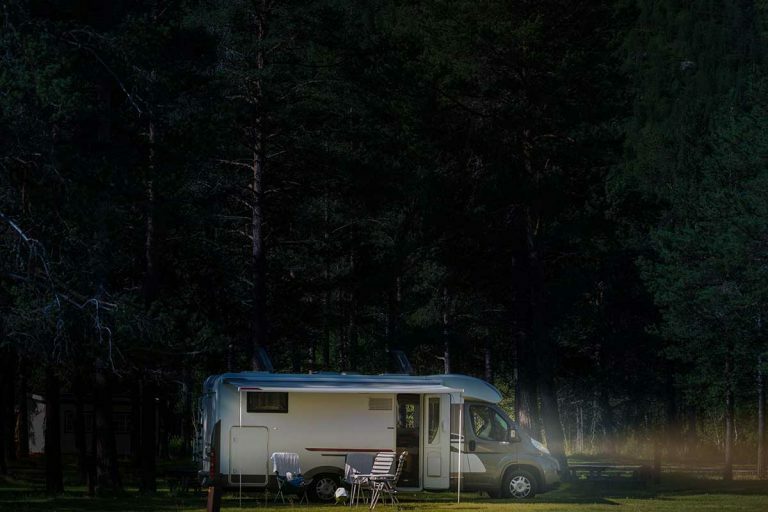 The neutral color palette, inspired by doeskin color, will make your RV look truly majestic. The Jackknife takes a classic design and gives it a fantastic overhaul, featuring a reclining loveseat that can be converted into a bed with 3 simple steps. Every part of the Jackknife that makes contact with the body is fully padded, fully maximizing comfort in one of the most ergonomic designs we’ve ever seen. Furthermore, the entire weight of the Jackknife sofa is supported by a steel frame that resists scratches, rust, and rough use thanks to its superior powder coating. We were impressed by the neutral gray colors that will make your RV seating space even cozier, seamlessly blending into the room while adding an eclectic appeal to your ensemble. Top this super comfortable loveseat with a woven blanket and some chevron throw pillows. This jackknife sofa is founded on a solid and manufactured steel frame that features the signature Thomas Payne PolyHyde Euro-leather vinyl upholstery. The sleeper sofa creates a visually striking silhouette with its detailed stitching. Furthermore, the fold-down center console provides storage space for 2 cup holders. 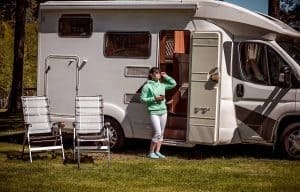 Your camper should have a pre-existing frame to support the sofa. A kickboard with its related hardware will be included with the loveseat, which means some assembly is required. You can buy this loveseat here. Crafted with a traditional design, this adjustable loveseat maximizes your RV’s functionality. It features a plush framework that is supported by highly durable polyurethane fabric that is easy to clean. The center console features space for two cups and some storage space. Furthermore, the footrest at the bottom can be pulled out for maximum comfort. RecPro incorporated a modular structure that comes in three different sections, which makes it easier to install the loveseat in narrow places. Click here to buy this product on Amazon. So, what do you think? Any favorites here? 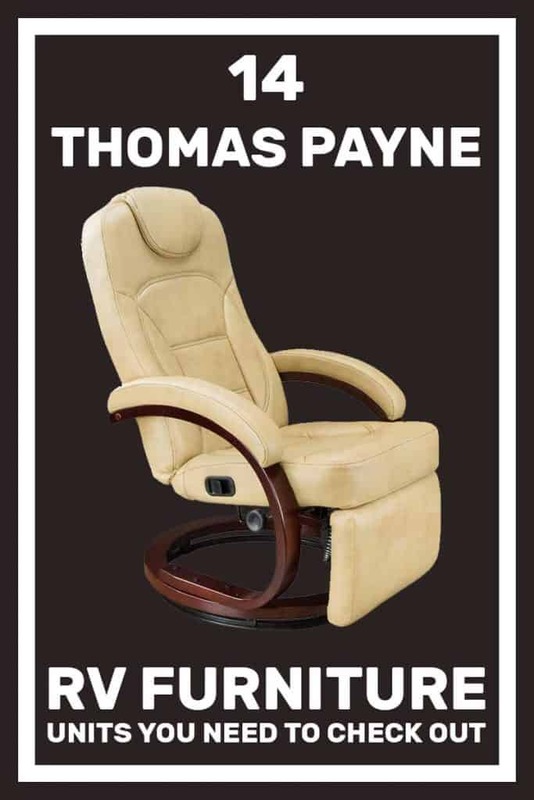 Have you tried Thomas Payne furniture items in your RV? If so, would you recommend the brand? Leave us a comment to let us know! 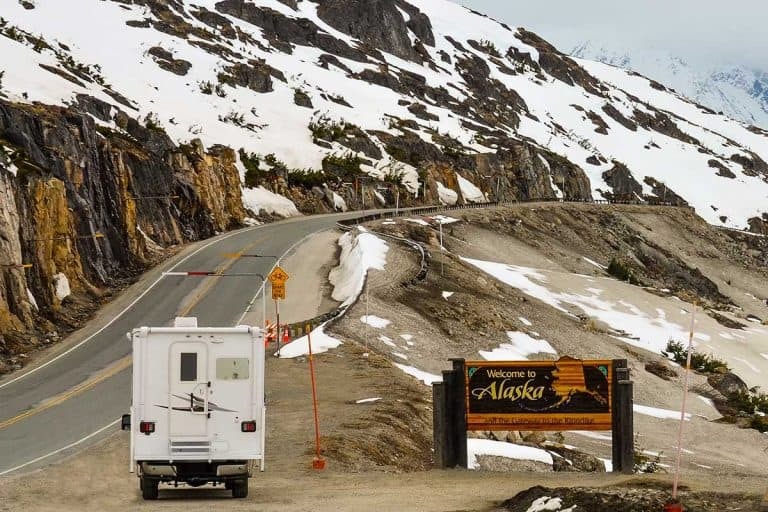 Previous PostWhere Can You Park an RV in Las Vegas?